Dr. Richards graduated from the University of California, Davis in 2003 with a B.S. in Animal Science and a minor in French. Before going to veterinary school, she worked as a veterinary technician for several years and then moved to Monterey to work at the local wildlife rehabilitation center. She returned to Davis to attend veterinary school where she studied a variety of species. 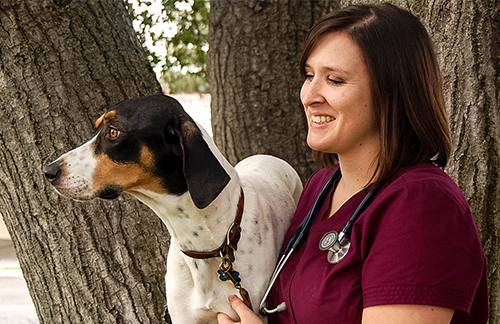 While in veterinary school she gained experience with companion exotic species by working as a part-time technician for the school’s Companion Avian and Pet Exotic service. Following her graduation in 2011 she obtained a degree in population health at UC Davis called the Master of Preventive Veterinary Medicine. As a part this degree, she worked with the Oiled Wildlife Care Network at UC Davis to design a research project investigating new methods to improve avian rehabilitation and oil spill response. While completing this project she also worked as a full time veterinarian at a small animal hospital in the Sacramento area. 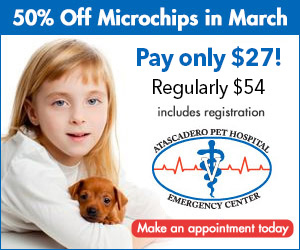 She moved to the Central Coast and joined the staff at Atascadero Pet Center and Emergency in 2014. Her special interests include avian and exotic medicine, surgery, and emergency medicine. Her other interests include traveling, hiking with her dog and most any other outdoor activity.